The museum has a variety of merchandise related to the history of Washington, Connecticut for sale. Items can be purchased at the museum or by mail for an additional shipping fee. Please email info@gunnhistoricalmuseum.org to place your order. 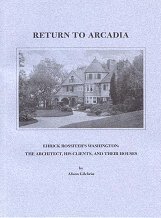 Ehrick K. Rossiter, an exceptional local architect with international recognition, remains a figure of interest to many. Born in 1854, he was strongly influenced by both English architectural forms and early New England aesthetics. 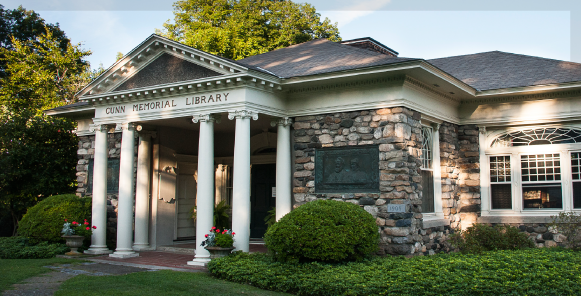 Washington boasts an outstanding array of Rossiter buildings, Gunn Memorial Library among them. Each home has its own charm, which only a century of use by different owners can bestow. The houses were originally built as summer cottages for wealthy New Yorkers, many of whom were artists; most are now occupied year-round. 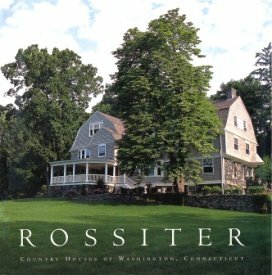 This limited edition documents many of Mr. Rossiter’s houses in Washington, Connecticut with 116 color photographs by Miki Duisterhof and book design by Wendell Minor, showcasing the homes as they exist in the twenty-first century. The book recently won the book design category of the 2007 Connecticut Book Award. Production of the book was underwritten by Ericson Insurance Services and the Chubb Group of Insurance Companies. Edition: Hardcover with dust jacket. 10.25 x 10.25 inches; 156 pages; 116 Full-color images. $75. All proceeds benefit Gunn Memorial Library, Inc. This scholarly volume documents the work of architect Ehrick Kensett Rossiter. Among his designs are more than two dozen Shingle Style and Colonial Revival cottages within a one-mile radius of the Washington, Connecticut Green. “The Rocks,” “The Knoll,” “The Sumacs” — these were among the large, rustically stylish country homes called cottages – a deliberate understatement by their owners to set themselves apart from the pretension and tastelessness of the nouveaux riches who were establishing palatial seaside estates in Newport and Greenwich. The perception of Washington’s Green as a “fairyland” and an arcadia apparently extended to its social complexion as well as to its physical appearance, as its residents sought a more pastoral lifestyle. $15. All proceeds benefit Gunn Memorial Library, Inc.